There's a fantastic sense of fun and wonder in Mission: Impossible - Ghost Protocol and when you consider that the flick's director is Brad Bird, the man behind some of the best Pixar films (The Incredibles, Ratatouille) and The Iron Giant (one of my favorite animated films) it isn’t hard to understand why. 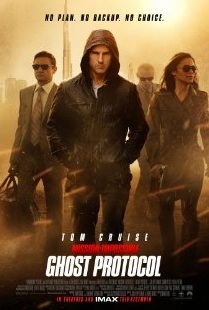 The film revolves around Tom Cruise's IMF Agent Ethan Hunt and his team of spies, who are trying to thwart a plot by a villain bent on nuclear war (The Girl with the Dragon Tattoo's Michael Nyqvist, who is somehow bland and compelling at the same time) after their entire agency has been blamed for a bombing in Moscow and disavowed. There's a scene where one of the signature Mission Impossible tapes/messages fails to self-destruct on its own, a great little metaphor for the wounded organization. I took notes on the film's plot but trust me when I say it's not all that important (and not in a bad way, either). The best part of the film and its real stars – although all of the actors are great, especially Jeremy Renner – are the stunts (a scene on Dubai’s Burj Khalifa, the tallest structure in the world, will have your stomach in knots) and the gadgets. Man, the gadgets. The team behind Skyfall, the upcoming Bond film, should watch M:I4 for gadget inspiration. The aforementioned tower scene where Hunt uses high-tech sticky gloves and another where Hunt and Simon Pegg's bumbling Benji Dunn use a sophisticated screen to hide from a guard in plain sight are particularly fun due to the imaginary technology on display. Other than a few minor things, including confusion about events that occurred between this movie and the previous one, I wholeheartedly enjoyed this film. One thing I do have to bring up that’s more of an observation than a critique is all of the jumping in this film – I count at least six scenes where people jump off of or through some kind of structure. I guess jumping off things is kind of the Mission Impossible series’ trademark, but this film’s team took it to 11. According to Bird's IMDb profile, this was his first live action film and I think he's proven he can handle them beyond a doubt. I'm excited about his planned follow-up live action flick, 1906, based on the San Francisco earthquake that happened that year. The only downside I'm anticipating is that we won't get to see any high-tech gadgets. Sounds good! Great review. I'm all for people jumping off buildings! Good review! Looking forward to seeing this. Man I didn't even mention the gadgets, which were incredible and ridiculous in all the best ways. And man, that tall building scene was epic for sure. I respect the fact that Cruise did his own stunts on that one. @Pete - There's a ton of jumping and even more falling so if you haven't seen it yet, you're in for a treat. 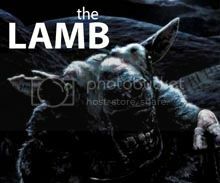 @Ty - I can't see how anyone would be that disappointed with this flick, so enjoy! Thanks for reading! @Alex - I agree, ton of respect for Cruise. I would need a net, safety harness and a parachute and I probably still wouldn't do that. @everyone - Thanks for commenting! yaykisspurr - Definitely non stop action. Thanks for commenting!